A thorough, step-by-step guide for restoring 240Z, 260Z, 280Z sports cars. Datsun parts-ID drawings included. Recapture the excitement and value by restoring your Z to like-new condition using the detailed restoration procedures given in this book. Wick Humble discusses the pluses and minuses of "frame-up" or "staged" restoration. 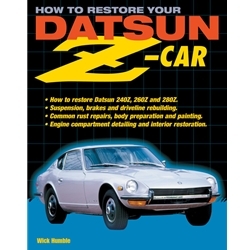 Packed with info--over 500 photos and drawings, plus a bonus section that includes 32 Datsun parts illustrations. Use this books to return your Z-car to its original glory! Covers all aspects of Z-car restoration!